Interesting articles regarding pension funds, state government and management. 10 Years Later: Have This Year’s Retirees Recovered From the Recession? MADISON, Wis. - The State of Wisconsin is suing a vendor contracted to build a new computer system for the Department of Employee Trust Funds, claiming they paid the company $14.3 million and only 7 percent of the project was completed. The Wisconsin Department of Justice filed the lawsuit on March 8, claiming Vitech Systems Group did not live up to a contract to create a new benefits system that would administer programs to public employees. A News 3 Now investigation first reported that the project had halted in March 2018, but lawmakers weren't notified until a July memo. Even after the memo, some lawmakers were not aware of the issue with the major project until asked by News 3 Now.
. . . go here to read whole story. 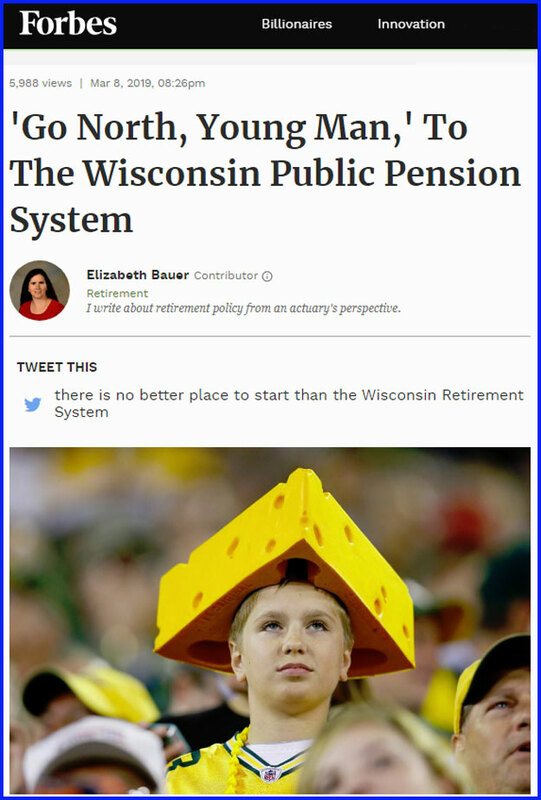 I am writing on behalf of the Wisconsin Coalition of Annuitants’ (WCOA) Board. 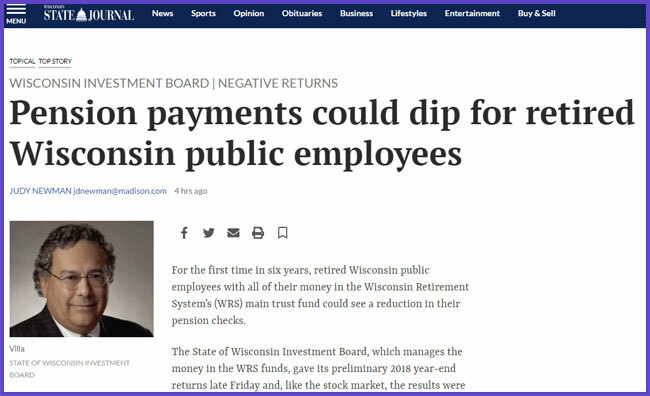 The WCOA is composed of organizations that represent retired state and local government employees who are covered by the Wisconsin Retirement System (WRS). Many of them also participate in the group health insurance program and other benefit programs under the supervision of the Group Insurance Board (GIB) and administered by the Department of Employee Trust Funds (ETF). 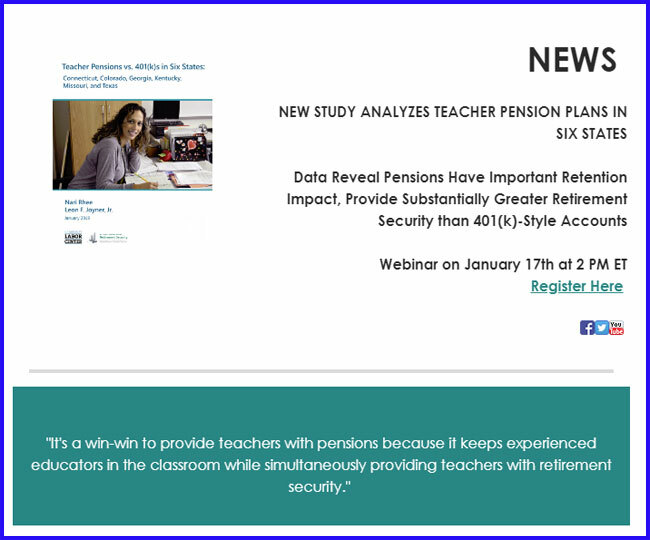 As such, the WCOA closely follows the two agencies that oversee the WRS and the other employee benefit programs to assure they are administered for the benefit of the participants. We trust you will share this with the other committee members. Thank you for your time. MADISON – Today, the nonpartisan Legislative Audit Bureau (LAB) released its biennial evaluation of the State of Wisconsin Investment Board (report 18-19). SWIB invests assets for the Wisconsin Retirement System (WRS), the State Investment Fund, and five other funds. As of December 2017, SWIB managed $117.0 billion in assets for the State. In 2017, the WRS Core Fund and Variable Fund exceeded five-year benchmarks with average annual investment returns of 8.6 percent and 13.3 percent, respectively. However, the Core Fund’s investment return did not meet the long-term expected rate-of-return assumption of 7.2 percent on a 20-year basis in 2016 or 2017. Given that SWIB projects it may earn investment returns between 6.2 percent and 6.8 percent annually for the next five to seven years, LAB recommends SWIB conduct additional stress tests that focus on the effect of sustained market downturns and certain other conditions. SWIB had 188.0 authorized full-time equivalent positions, and 40 contracted staff positions in December 2017. LAB reviewed five staff recruitments SWIB conducted in early 2018 and recommends SWIB revise its hiring policy to ensure it equally considers all qualified applicants. LAB also noted that, SWIB staff received $29.4 million in salaries and fringe benefits and $11.5 million in bonuses for 2017 performance. From 2013 through 2017, LAB found SWIB’s annual expenses increased by 21.7 percent. After considering the effect of increases in assets managed by SWIB, LAB found the increase in annual expenses was attributable to higher management fees paid to external investment managers for more-complex investment strategies, an information systems implementation, and the hiring of additional staff. LAB recommends SWIB track future technology project expenses, develop policies to require Board approval for expenses that exceed the total budget, and report investment returns that include management fees and other investment expenses to the Board. “I have long been an advocate of prudent fiscal management in state government. Maintaining thorough oversight of operating and project expenses needs to be at the forefront of the Board’s priorities to determine the appropriateness of budget overruns and avoid unnecessary cost while continuing to allow SWIB to manage investments to the best of their ability,” said Senator Robert Cowles (R-Green Bay). Copies of report 18-19 may be obtained from LAB’s website, www.legis.wisconsin.gov/lab, or by calling (608) 266- 2818.